Each number added to an account gets assigned to a Number Plan. Bundled Line, are set at $0.00. This is recommended to be used in Bundled Plans, in a Bundled Plan the customer get X amount of numbers within the plan as well as X amount of Regional/National and Mobile minutes. Naked Line, are set at $2.27. This is a basic Number Plan and the customer will not get to use the basic PBX function. Local Line, are set at $5.00. This would be your standard Australian Regional Number Plan. used in the Pay-As-You Go Plans, or additional number on a Bundle Plan. 100 Number Blocks numbers. 100 Number block get charged as a group rather than individually. And the charged as a Billing Item. When creating Number Plans you are able to set the monthly cost for the number, and define the number types it can support. You need to give each Number Plan a name, this is the description. Think about the name types so that they relate back to the function of the number. Each number will have a different function and generally will need to be charged different amount depending on that function. The price needs to be GST exclusive. There are two different types of numbers functions- Voice and Fax. You can define which type the Number Plan will have, or choose 'Any'. By choosing 'Any' the customer can use that Number Plan for both Voice and Fax at the set price. Not a commonly used function. You can add a calling group will allocated minutes which is allocated the that Number Plan. Example: 'Local Number + USA' Number Plan is $10/month with 100 min of USA Calling Group and supports Australian Regional numbers only. In this case the customer has an Australian number, over and above the Plan they are on they also will have 100min to USA which is included for that assign number. The minutes field always needs to be filled in, use '0' for no Calling Group to be added. Each Number Plan can support a range of types of your choosing. Select what you would like to offer to give the customer the flexibility depending on what they are charged. 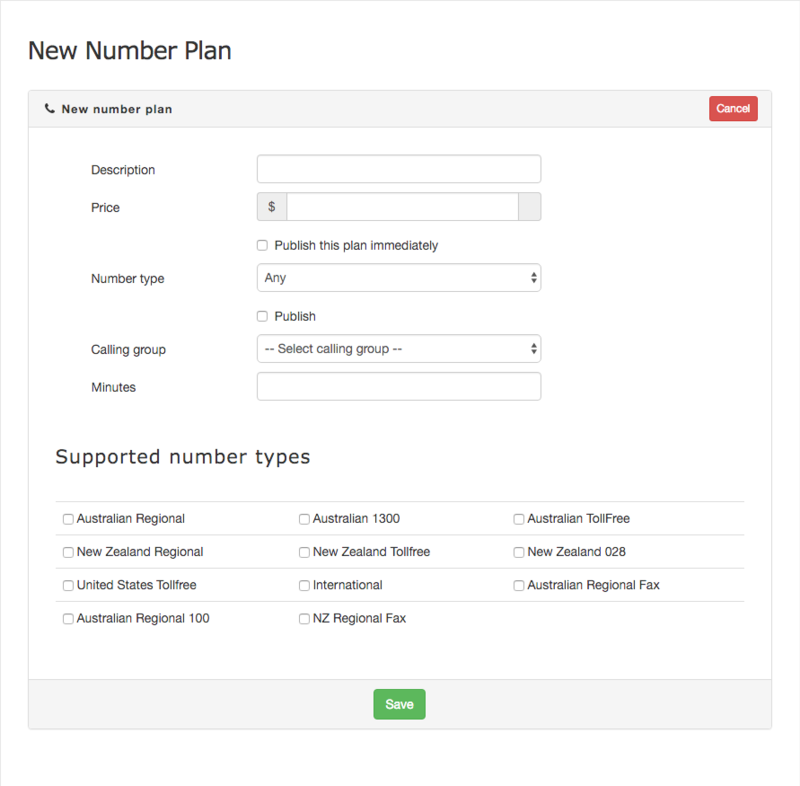 Click on the 'Add number plan' to create additional Number Plans. Publish/Unpublish means whether or not the customer can view the Number Plan. In the instance 'Publish' will mean the customer can view the Number Plan. Number Plans can be edit. If the number plan is being used they can only be partially edited.